Everything is just a little back to front in the land of the Frontiebacks. To start with, the alphabet begins with Z and the zebras live in the Ooz. That pretty much sets the trend for this very amusing alphabet book. Skunk smells beautiful, Rabbit hops backwards, Panda is purple, Hippo doesn't like muddy water and Elephant has the cutest little ears! And for X there's the Xolf, which doesn't even exist but certainly looks like it should. 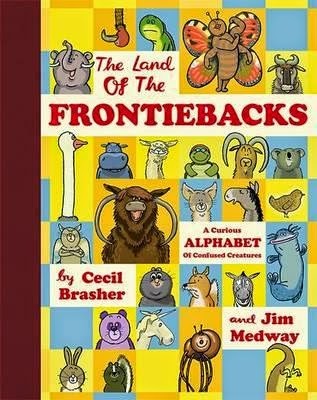 The illustrations have a gorgeously retro feel to them and do a fabulous job of bringing to life the quirky rhyming text for each alphabetical animal. Great fun.